The feeling of witnessing history as it unfolds before your eyes is one of those singular and uncanny things that really deserves its own word in German. It’s a feeling many of us have gotten used to over the past several months, thanks in large part to events in the Middle East that have appeared every bit as dramatic as anything we ever read in our high school textbooks. Processing the unrest in real time from half a world away has been humbling: The speed of events, and the fact that no one saw them coming, has made even short-term predictions seem like a fool’s errand. Even so, as bombs fall over Libya and protesters clash with government forces in Bahrain, Yemen, and Syria, the impulse to understand what’s going on is extremely strong. To that end, people have reacted by doing what they often do when confronted with high-stakes uncertainty about the future: They’ve turned to the past. 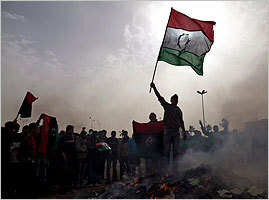 Several historical reference points have been floated since the outbreak of demonstrations in Tunisia, including the student revolts of 1968 and even the American rebellion of 1776. But the most frequently cited of them all has been the end of communism in Eastern Europe in 1989, an unequivocally invigorating antecedent that suggests the Middle East is on the cusp of a happy paradigm shift. 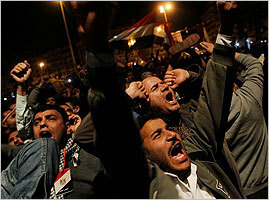 As German Chancellor Angela Merkel put it 12 days into the Cairo demonstrations, “We are seeing pictures awaken memories of what we experienced in Europe...people who are shaking off their fear, people who are saying what they don’t like, who name injustices by name.” Indeed, at the time, there was every indication that we were seeing regimes collapse one after another, just like they did when the Berlin Wall fell: The president of Tunisia had been chased from power; Yemen’s president had announced that he wouldn’t run for reelection; and the administration of Hosni Mubarak looked decidedly outnumbered by the tireless crowds in Tahrir Square. Yet since the start of the so-called Arab Spring, a chorus of historians and commentators has been arguing that the most fitting historical analogy to what’s happening in the region right now may be significantly less giddy-making. For them, the period we should be thinking about is not 1989, but rather 1848, when a cascade of revolutions engulfed Europe only to be extinguished by forces of the old order. While the 1848 analogy is a long way from perfect, the past several weeks have made it abundantly clear that the situation at hand cannot be seen as a triumphant repeat of 1989. With protests being violently put down across the region, and the uprising in Libya devolving first into civil war and then a full-on international conflict, one wonders whether 1848, with its legacy of violence, bloodshed, and ultimate failure at the hands of tenacious counterrevolutionaries, will turn out to be the best road map we have. The analogy between Europe in 1848 and the Middle East in 2011 comes down to several key similarities. Both periods were marked at first by newly discovered feelings of defiance, with people young and old who had previously thought themselves powerless against the forces of government realizing their collective might and rising up in protest against their rulers. In both scenarios, that awakening took the form of a series of spontaneous, largely leaderless uprisings propelled by economic discontent and a call for civil liberties: Just as the revolts in the Arab world began this winter in Tunisia and spread from there, 1848 saw something like a chain reaction that began on the island of Sicily before moving to Paris and then igniting in Vienna, Berlin, and elsewhere. And as Anne Applebaum pointed out in Slate recently, those chain reactions were marked by a mess of motivations: Far from being carried by a single opposition movement, both periods of unrest should be seen as multipronged affairs, with different countries erupting for different reasons even as the revolutionaries in each place drew inspiration from one another. Of course, analogies are only that, and as much fun as they can be for history buffs, one must be careful not to extrapolate so much from similarities that important differences get lost. Journalist Kurt Andersen, host of the radio show “Studio 360,” wrote a piece in Time earlier this month arguing for the 1848 comparison based on research he did for his historical novel, “Heyday,” part of which is set during the Paris uprising. He said that while over-committing to an analogy has the potential to cloud a person’s judgment, it’s still better than not thinking about the past at all and letting the present overwhelm us with its unpredictability. Taken together, the 1848 revolutions added up to a seismic disruption of the status quo in Europe that gave voice to long-simmering feelings of nationalism and widespread desires for liberalization. The context was a massive recession: The potato famine in Ireland and a weak grain harvest had caused food prices to skyrocket, which in turn had led to a credit crisis and widespread unemployment. Working-class people, who had spent the decade flocking to cities, grew increasingly resentful of the conservative rulers who were allowing the crisis to happen, while relatively wealthy liberals wanted civil rights and expanded suffrage. This convergence of economic suffering and political frustration came to a boiling point at the end of January 1848, when demonstrators on the island of Sicily took to the streets of Palermo demanding constitutional government and a unified Italian state. The revolution in Sicily, like the Tunisian uprising, is unlikely to have been seen as any kind of major event if it had been an isolated case, but thanks in part to new technologies like the telegraph and steam-powered transportation, it was a catalyst that emboldened disaffected people all over Europe to take up arms against regimes whose dominance had very recently seemed invincible. 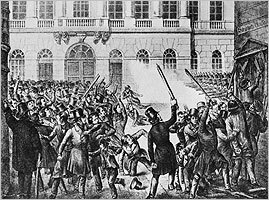 Once word of the Sicilian rebellion traveled north, things moved quickly: Street protests erupted in Paris on Feb. 22, and three days later King Louis Philippe, who had been in power since 1830, abdicated his throne. In March, the revolutionary spirit moved to Vienna, leading to the ouster of Chancellor Klemens von Metternich after more than 20 years of rule. Alas, the wave proved to be as brief as it was broad, and by the start of summer, the revolutionary movements that had seemed so potent earlier in the year had all but come undone. Historians say it was a matter of having too many cooks in the kitchen — that once the fun part, so to speak, of toppling the oppressive regimes was over, the revolutionaries had to grapple with the fact that they didn’t have a lot in common. “Students, industrial workers, craftsmen, artisans, shopkeepers, clerks — they all wanted a lot of different things, which is part of why the revolution wasn’t quite able to succeed in creating a new order,” said Sperber. Though some democratic goals were achieved — constitutional governments were established throughout Europe, for one thing, and serfdom was permanently abolished everywhere except in Russia — the opposition movements proved incapable of building proper governments and fell apart due to ethnic and political schisms. 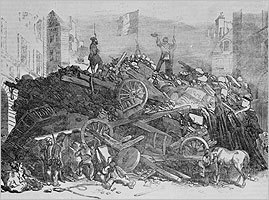 Nowhere was the splintering more vivid or punishing than in Paris, where in June of 1848 thousands of people were killed in a conflict between moderates and radicals who had been fighting side by side against a common enemy just a few months earlier. The discord allowed the old conservative order to reassert itself, and by 1851, France was once again ruled by a self-proclaimed emperor. Of course, many historians would say such predictions rely on overly crude generalizations, and that the innumerable differences between Europe in 1848 and the Middle East in 2011 — starting with the roles of religion, oil, and technology — render the comparison frivolous. But as Mark Twain put it, “History doesn’t repeat itself, but it does rhyme.” And by looking closely at that rhyme, it is possible to learn a great deal — not for nothing does the State Department employ a team of historians whose job it is to brief diplomats and other government officials on the events of the past. With that in mind, it may be comforting to know that in recent years, historians have significantly revised the conventional wisdom that the revolutions of 1848 ended in failure. Though their immediate aftermath was a decade of reactionary, oppressive rule, the 1860s saw a resurgence of democratic aspirations that was made possible by the earlier upheaval. According to Sperber, large swaths of society became far more politically conscious as a result of the revolutions, and, generally speaking, the liberal aims and values that were voiced during those early weeks and months eventually became part of the public agenda. “The aspirations didn’t disappear and the people who supported these ideas didn’t disappear,” says Sperber.